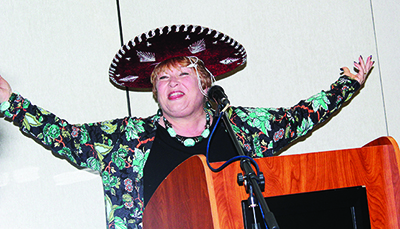 Kim Sheeks, aka “The Hat Lady,” also tickled the audience’s funny bone with humorous stories associated with the various hats she adorned. Dr. Faleese Moore Jenkins, the First Lady of Livingstone College, and Dr. Carolyn Duncan, Livingstone College vice president for academic affairs, brought greetings. One of the highlights of the program was a hat parade/contest. Winners were Corine Parks, church hat; Catherine Rivens, most unique; Ella Woods, the fascinator; and Yolanda Woods, sassy. The brunch was sponsored by Food Lion (corporate sponsor) and the following individuals: Dr. Carolyn D. Anderson, Levonia Corry, Delta Sigma Theta Sorority Inc., Peggy M. DuRante, Dr. Catrelia Steele Hunter, Stephanie Jones (The Ladies of WEE), Hazel S. Kennedy, Willie Jean Kennedy, Phyllis A. Mahmud, Vincia Benjamin Miller, Earle L. Smith and Susan M. Watson. About Livingstone College Livingstone College, founded and supported by the African Methodist Episcopal Zion Church, is a private historically black institution located in Salisbury, N.C. Through a Christian-based environment suitable for learning, it provides excellent liberal arts and religious education programs for students from all ethnic backgrounds designed to develop their potential for leadership and service to a global community. For more information, visit www.livingstone.edu.